Here’s a great salad to celebrate citrus season! As a girl growing up in California, many of my friends had kumquats growing in their backyards. These are such a treat! 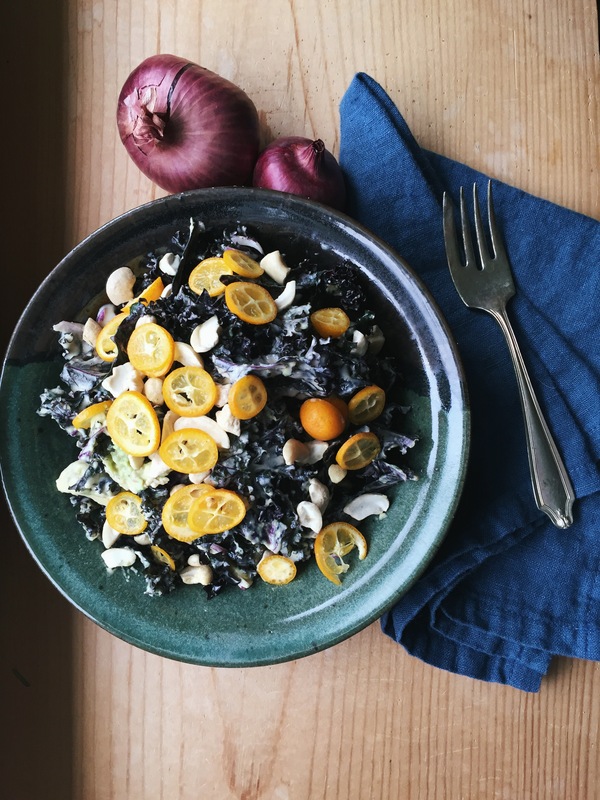 This easy salad is an homage to my roots- it’s like sunshine in a bowl. 1. In a blender, combine tahini, garlic, lemon juice, water, maple syrup, and chili powder. Blend until smooth. If it’s too thick, add more warm water. Season with salt. 2. Toss massaged kale, avocado, and onion with enough tahini dressing to coat. Place in a large serving bowl. Top with kumquat slices and cashews. Welcome back CSA members and other readers around the world! I’m excited for another season of delicious produce and I will be focusing on some great, healthy recipes to keep those new year resolutions working! 1. In a large mixing bowl, stir together tuna, mayo, pear, celery, onion, mustard, lemon zest and juice until well combined. 2. To serve: Create a bed of lettuce in a serving bowl or individual bowls. 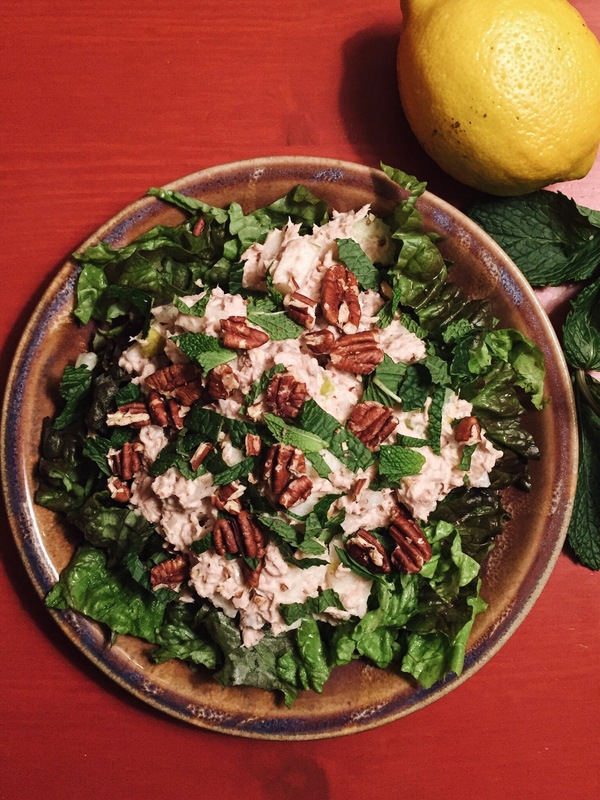 Place tuna salad on top of romaine, then top with chopped mint and pecans. **Note: Our oceans are being depleted of fish at an alarming rate. This is partially due to unsustainable fishing practices being used across the globe. Seafood is, of course, a staple of our cuisine in the Pacific Northwest and so I believe it is important to be responsible consumers and be sure we know where our seafood is coming from and how it is being harvested. Because canned tuna is often unsustainably caught, it is especially important to be informed as to where and how it is being sourced. In the northwest, we are lucky to have the Fishing Vessel – St. Jude, a family owned and operated tuna fishing boat. By exclusively trolling for tuna, the St. Jude eliminates bycatch and waste while controlling the quality of tuna they catch. St. Jude tuna is available at many local grocery stores and farmers markets and I encourage you to seek them out. Another great option is the Wild Planet brand of tuna which is available at PCC and Whole Foods. For more information about sustainable seafood, please visit http://www.seafoodwatch.org. With all the wonderful spring greens we’ve been getting from the CSA, it’s nice to have some simple dressings up your sleeve. This is a basic recipe that can easily be modified to utilize a variety of herbs: parsley, mint, cilantro, and lemon balm are all great choices. I’ve made a note to leave the leaves attached to the stems- the stems have great flavor and make a delicious addition to the dressing. We’ve been enjoying it with massaged kale and beets lately. Have fun playing with all the different flavor combinations! In a food processor, pulse the garlic and anchovies until minced. Add the yogurt and lemon juice or vinegar and blend until combined. Add the parsley and pulse until minced. Take care not to over process the parsley otherwise the color may change into a drab green. 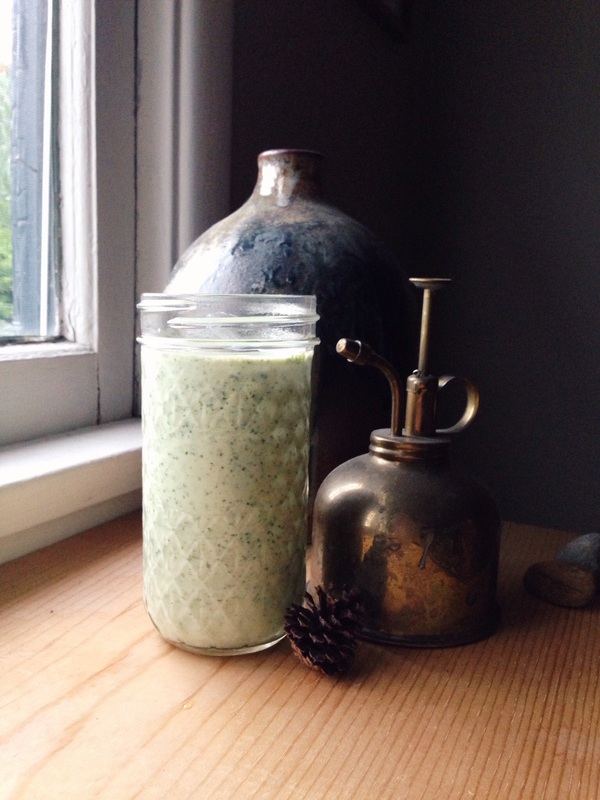 Toss spring greens with the dressing or use it as a dipping sauce for crudites or artichokes! Spring is in full swing here and the lengthening days have me thinking about garden parties and evenings spent outside with friends. This recipe is slightly more composed than some of the others I’ve posted here, but it would make a simple yet impressive appetizer for a party of 4 or a light supper for 2. If you have access to any edible flowers like chive blossoms, they would make a lovely garnish! 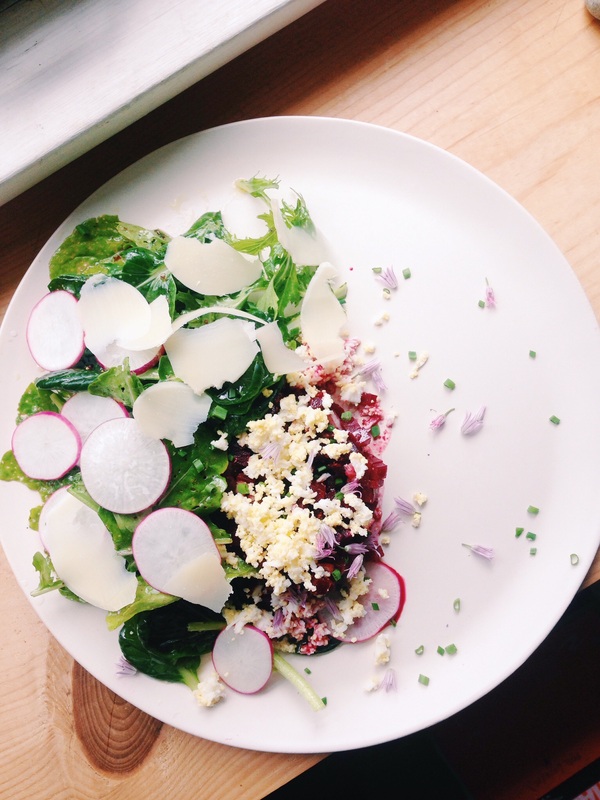 The small diced beets in this dish along with the sieved egg and shallots mimic a traditional beef tartare, but are a great vegetarian alternative- in fact, I prefer this version to the classic. 1. Place the beets in a pot and cover with water by 1 1/2 inches. Add a teaspoon of salt. Bring to a simmer and cook until beets are easily pierced with a fork. When they are finished, remove them from the water and allow them to cool. When they are cool, use a paper towel to rub off the skin. Next, cut them into slices and cut the slices into small cubes. Set aside. 2. Cut the egg in half lengthwise and press through a mesh strainer or sieve. If you don’t have either of these finely chop the egg and set aside. 3. In a mixing bowl, combine vinegar, olive oil, mustard, honey, and a pinch of salt and pepper. Whisk until emulsified. Set half of the dressing aside. 4. Place the chopped beets and shallots into the bowl with half the dressing and toss, coating everything lightly. 5. Place the beet mixture in a pile in the center of each plate. Top the beets with sieved egg and sliced chives. Then in the mixing bowl, add the remaining dressing along with the greens and the radishes and toss to coat. Gently pile the salad along the side of the beets. 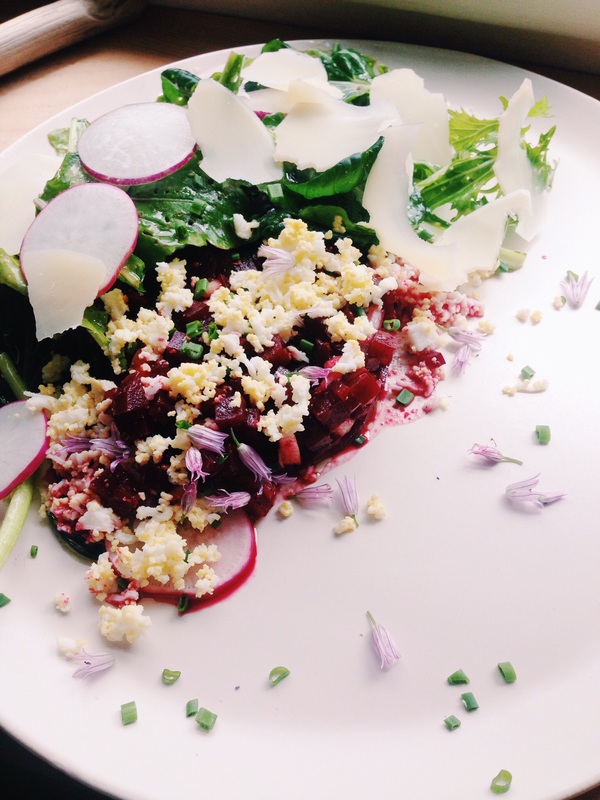 Scatter the cheese over the salad greens and beets. Enjoy with some rye crackers or crusty bread and glass of wine! In the Fall our inclination seems to be to roast everything in sight. I totally understand this, but sometimes your body starts to crave fresh flavors again. This salad is the answer to these cravings! 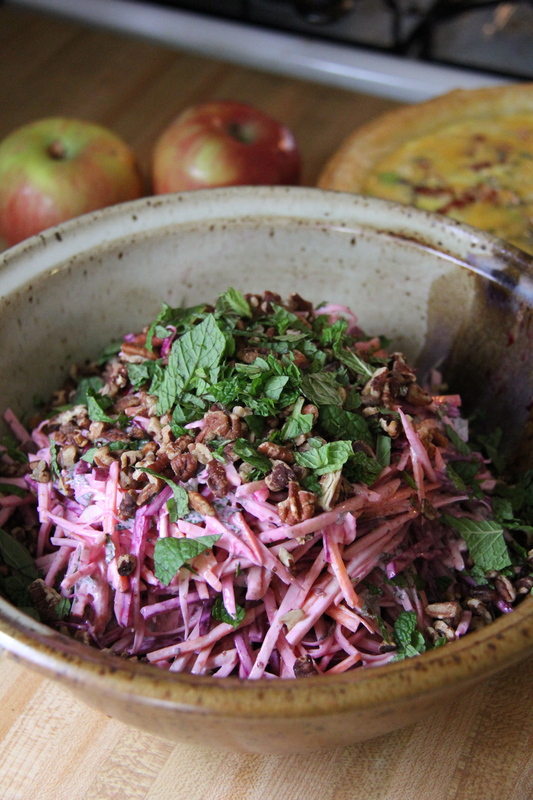 Enough to serve two for lunch or more as a side, this salad embraces the more delicate flavors of celeriac and apple while keeping things grounded with undertones of earthy beet and blue cheese. If you don’t have a mandoline slicer in your kitchen arsenal, I highly recommend putting one on your Christmas list. Without one, feel free to use the coarsest grater on a box grater or food processor to give the salad a slaw like texture. Finally, I’ve included the option to add some sliced prosciutto to the salad. If you’re enjoying this as a lunch, the addition of prosciutto will bulk things up and add some protein. Mix together the lemon, sour cream, blue cheese, and Dijon with a pinch of salt and pepper. Roughly chop the mint. Reserve a tablespoon to the side for garnish. 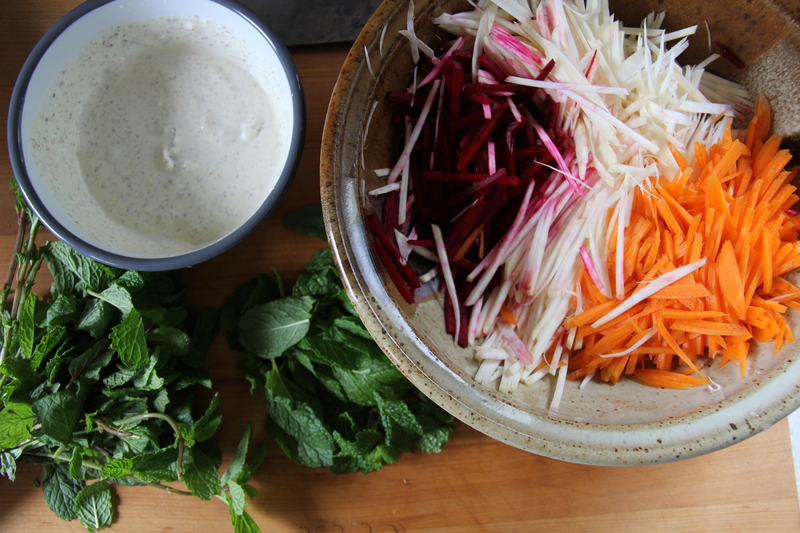 In a mixing bowl, toss the celeriac, beet, carrot, apple, and mint in the sour cream dressing. Place the mixture in a serving bowl and top with nuts and mint (and prosciutto, if using).